A worker with the Lagos State Waste Management Agency, Oluwaseun Thomas, is currently on admission at a private hospital on the Lagos Island, after hoodlums stabbed him in the eye for allegedly reporting their activities to the police. Thomas was said to have been beaten up by the hoodlums, before they stabbed him in the eye. Punch Metro learnt that Thomas, whose work area was Oja Oba Market on Dosumu Street, was initially rushed to the Lagos University Teaching Hospital, Idi Araba, to remove the hoodlums’ knife which was left in his head, before being taken to a private hospital for further treatment. It was gathered that Thomas had supplied information, through a community leader in the area, to the police Special Anti-Robbery Squad, Ikeja, that hoodlums kept weapons in a hideout in the market. The SARS policemen were said to have stormed the market, and recovered the weapons, including cutlasses, knives and guns, but they were unable to arrest the hoodlums. On Thursday, January 21, 2016, at about 9pm, Thomas, who was on a night duty, was clearing some refuse in the market when the hoodlums attacked him.Apart from Thomas, some other workers of the agency at the market were also attacked. 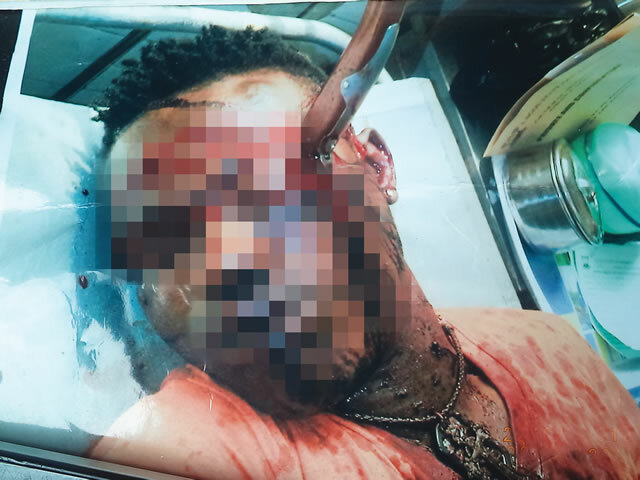 After stabbing him in the eye through the side of his head, the hoodlums abandoned the LAWMA worker by the roadside with the knife stuck in his eye.Residents, who alerted the police at the Adeniji Adele division, were said to have also rushed him to LUTH. Speaking with PUNCH Metro, a resident, Saheed Alatise, said he initially thought the hoodlums came to extort money from the LAWMA workers. He said, “The hoodlums got information that some LAWMA workers gave the police information on the location of their weapons. Our correspondent gathered that a LAWMA driver, identified simply as Suraju, and one Azeez Taofeeq, were among those who sustained injuries. A woman, who is a community leader, but spoke on condition of anonymity, said the attack on the LAWMA worker was successful partly because he put on his earphones on the night of the incident. She said, “Thomas just finished secondary school and he is looking for money to start his university education. Thomas could not speak with PUNCH Metro due to his condition. Doctors at the hospital said he was still unconscious. The Police Public Relations Officer, SP Dolapo Badmos, also confirmed the incident, adding that the police were waiting for the complainant to give a lead on the arrest of the hoodlums.